Hello, Friends! 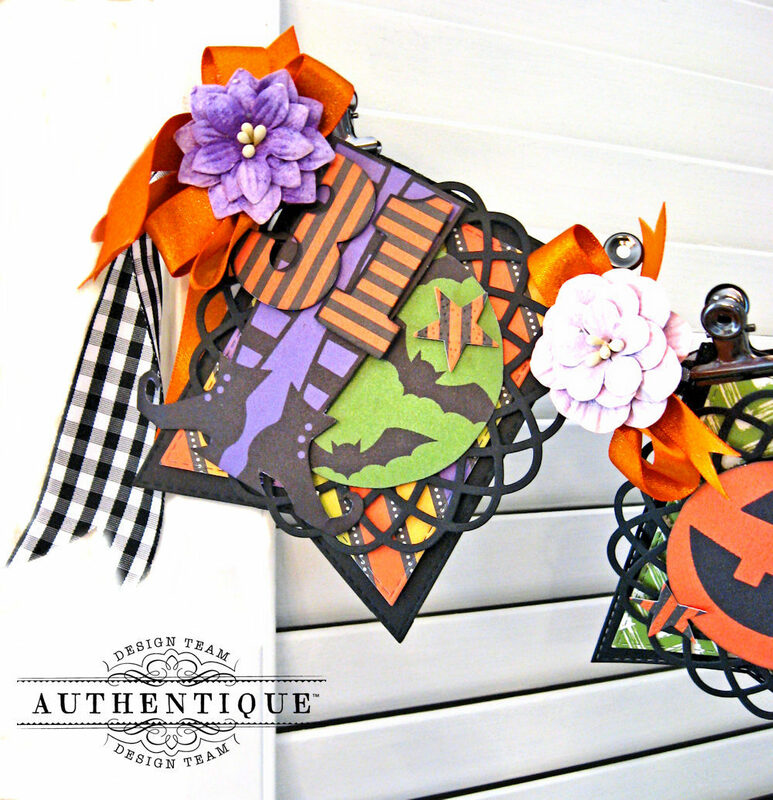 Do you like to decorate your home for Halloween? I do! 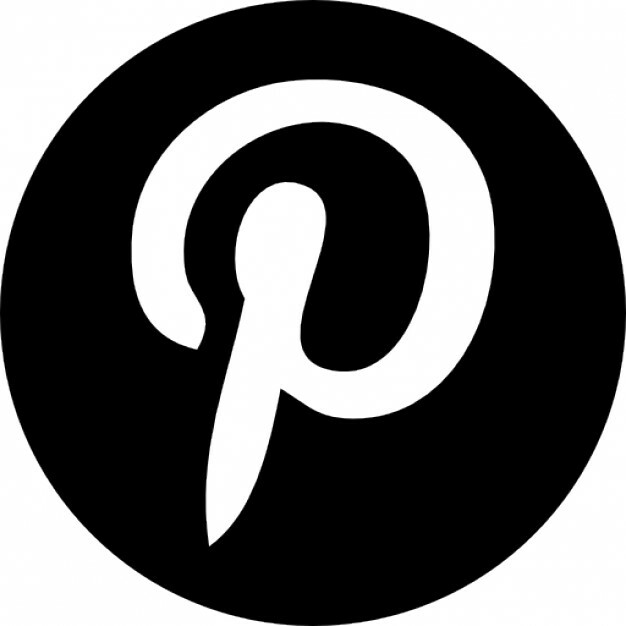 Banners make every day feel like a party is about to happen, and they so much fun to make. 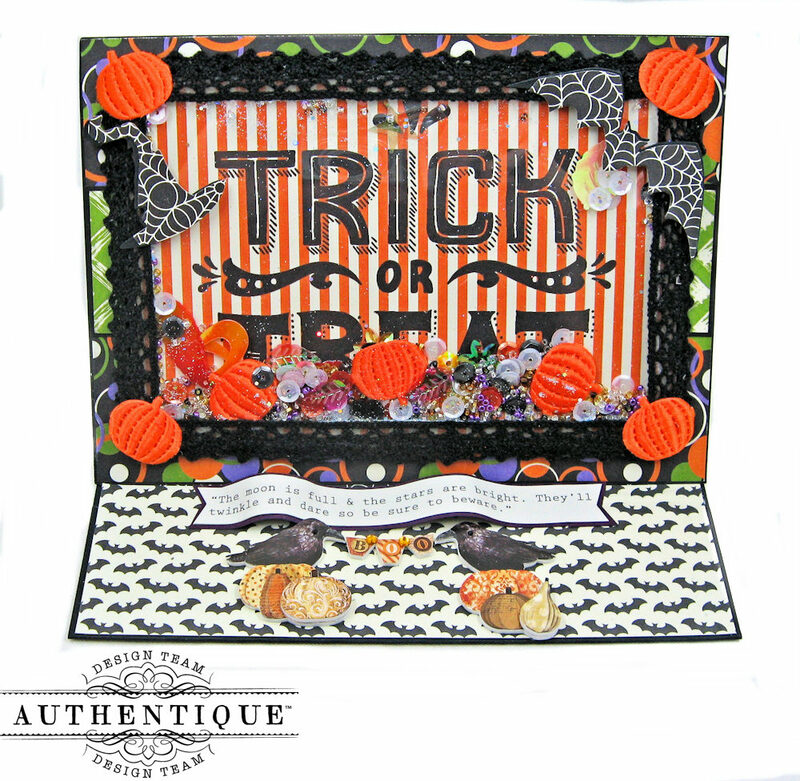 Today I have a really fun banner made with Authentique's fiendishly fabulous Tricky collection. I love the wonderful colors, patterns and images of this fall collection! Making this banner was so much fun that I kept right on playing until I had a sparkly, spook-tacular shaker card and a too cute to spook card folio made as well. 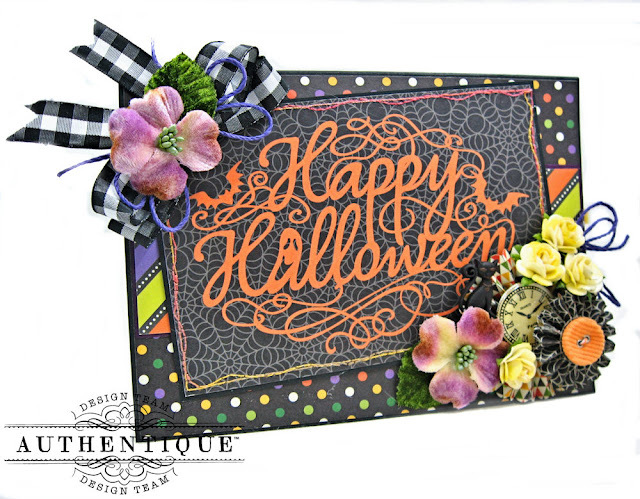 No tricks here...just all treats on this vibrant banner. 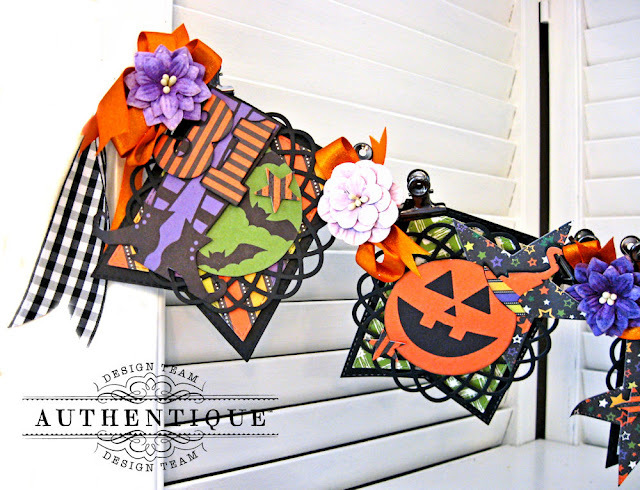 Using dies to layer up these fabulous papers helped this Tricky banner come together very quickly. 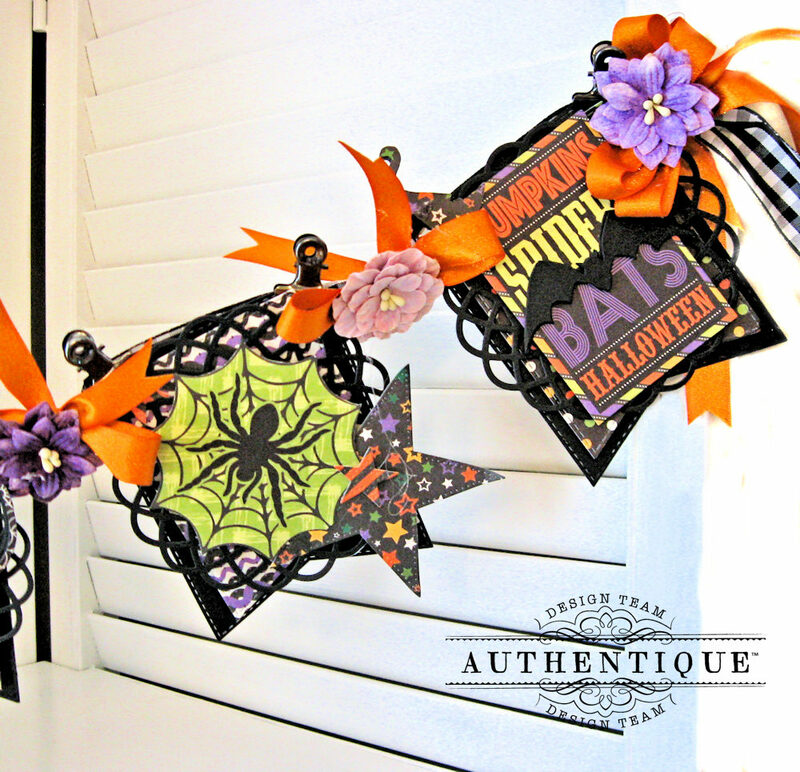 Add a die cut black doily. 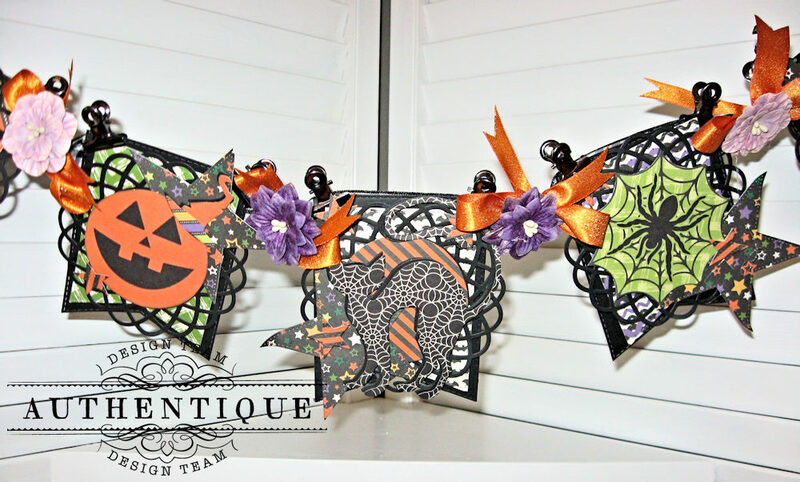 Add die cut stars and Halloween images. These purple witch legs crack me up. They really steal the show when fussy cut and layered with foam dimensionals. 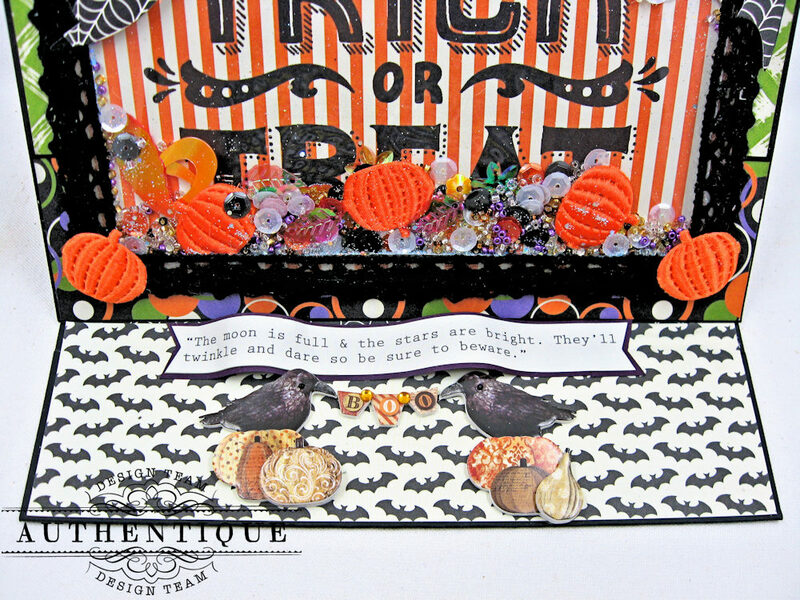 I used a circle die to cut out the bats and pumpkin images from the cut apart page. To make this black cat pop, I die cut it twice: once from black cardstock then again from patterned paper. 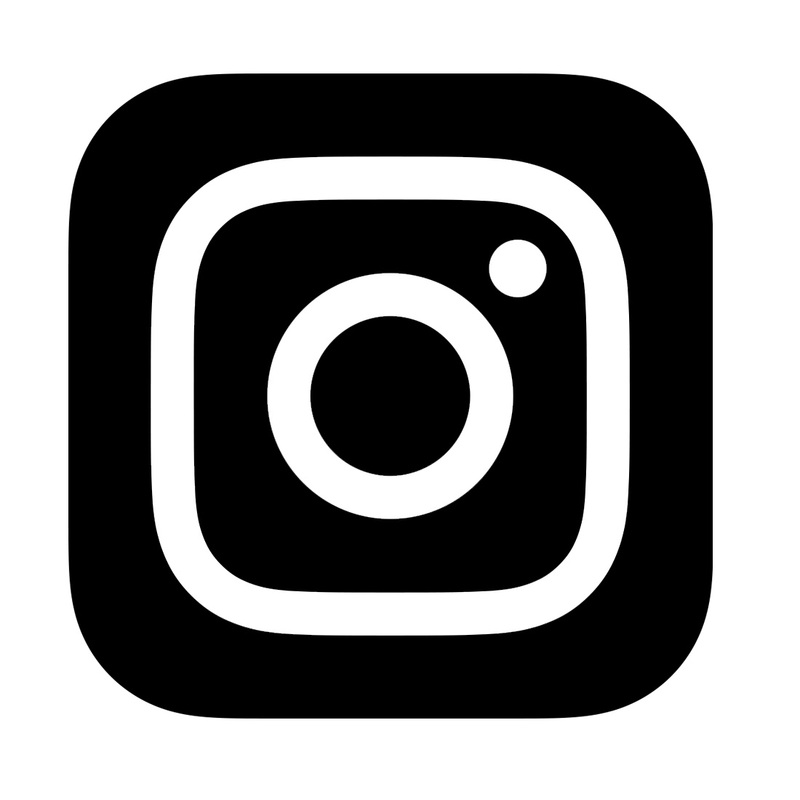 When you glue the two layers together, offset them slightly to provide a drop shadow. Then layer on with foam tape. Fussy cutting this creepy spider web takes just a second, and it looks suitably spooky in the center of the black doily. On the last pennant, I added a die cut bat with foam tape. You can easily make this "no sew" banner in an afternoon or less, and it will add so much fun to your Halloween decor. Since I was having such a good time playing with Tricky and all the "stuff" was already out on my desk, I decided to make a couple of Halloween cards using the horizontal images from the cut apart page. Shaker cards are taking center stage in the paper crafting world right now. And you can see why! 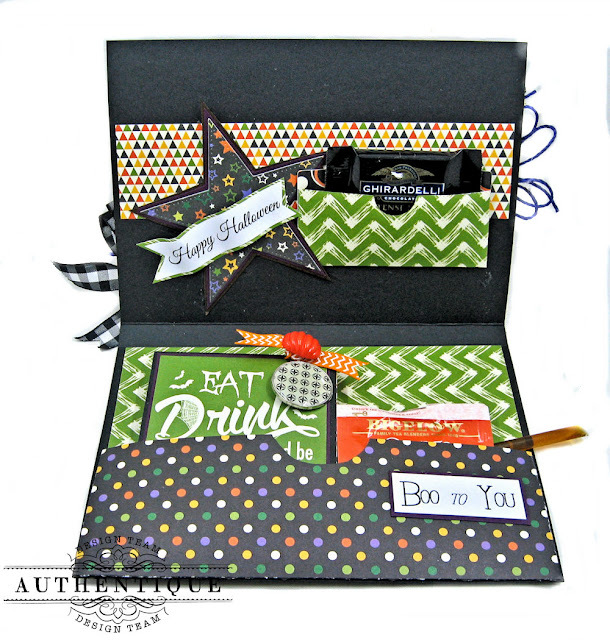 A good shaker card is like a party on paper! This 7" x 5" shaker easel card takes things to the next level. Place this on your scoring tool with the long side against the rail. Score at 5" and again at 7.5"
Burnish the score lines and fold to create a 5" x 7" top fold card. The card front will have a horizontal fold. The bottom half of this fold is where you will attach the finished card cover. 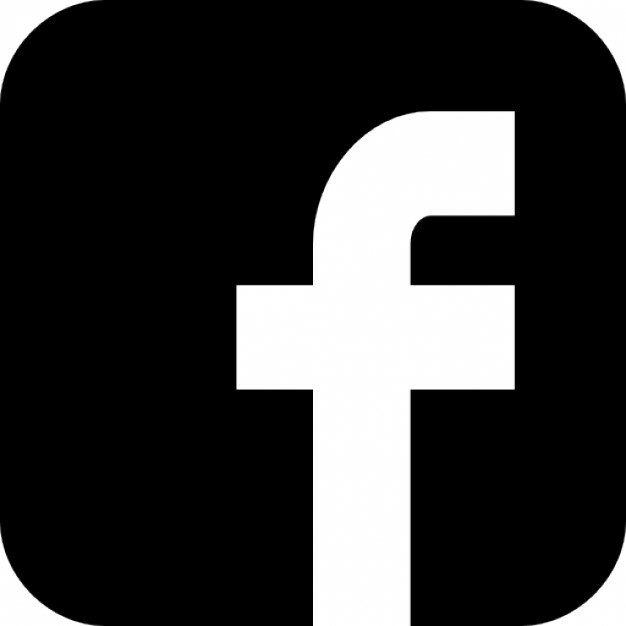 Cut a second 5" x 7" rectangle from black cardstock. This will become the card "cover". 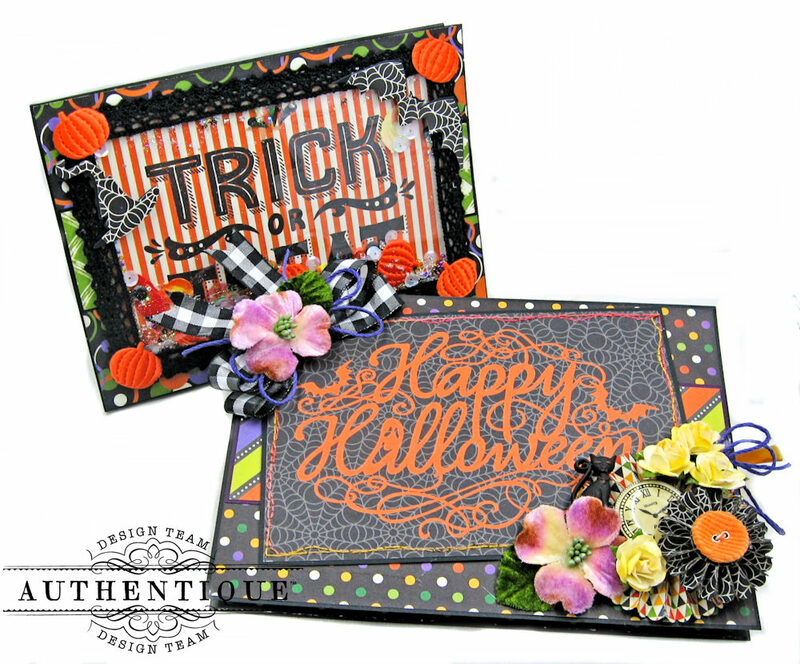 Decorate and then glue the BOTTOM half of the decorated card cover to the bottom half of the prepared card base. 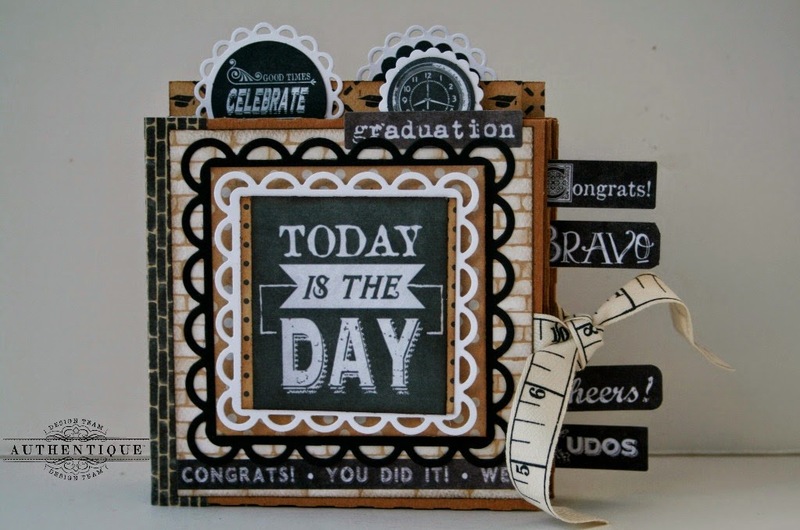 Create the "stopper" for the easel card by cutting the sentiment from the top of the Tricky paper. Mat on deep purple cardstock and weave it between your fingers to add dimension. Glue both ends and the middle as seen here. I found these cute stickers in my stash and added them for extra fun. Here's a peek at the inside of the card. The sentiments were created on my computer and added to the card base. But you could easily stamp a Halloween sentiment if you had one. 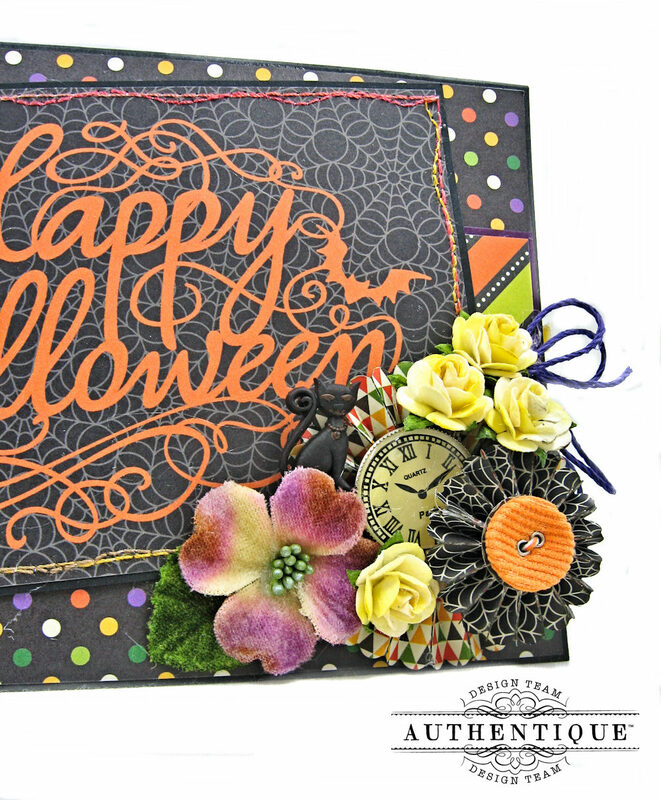 This card is super quick to make. 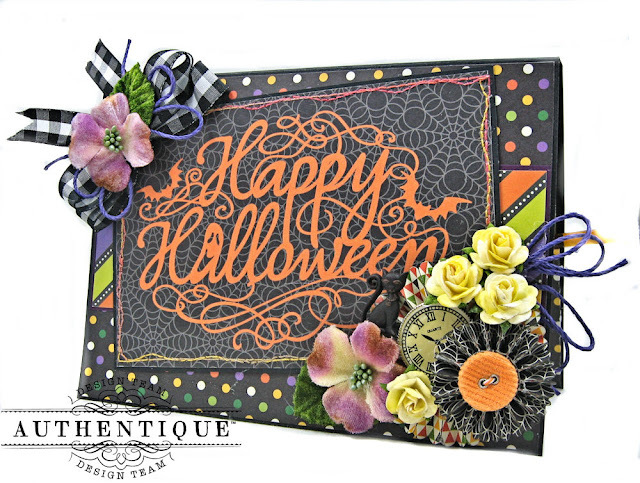 Just create a 5" x 7" card base from black cardstock, layer it with the dotty paper. 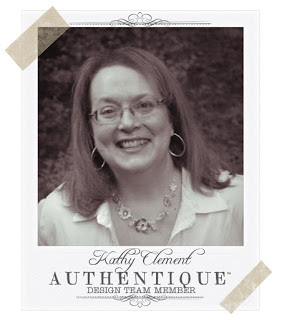 Add a horizontal strip from the diagonal stripes. Stitch the 4" x 6" image to black cardstock using messy stitching. This is a great "grown-up" Halloween card. I created rosettes with a strip die, layered up some flowers, a black cat novelty button, ribbon and string to make a card folio that's pretty enough to use as home decor. 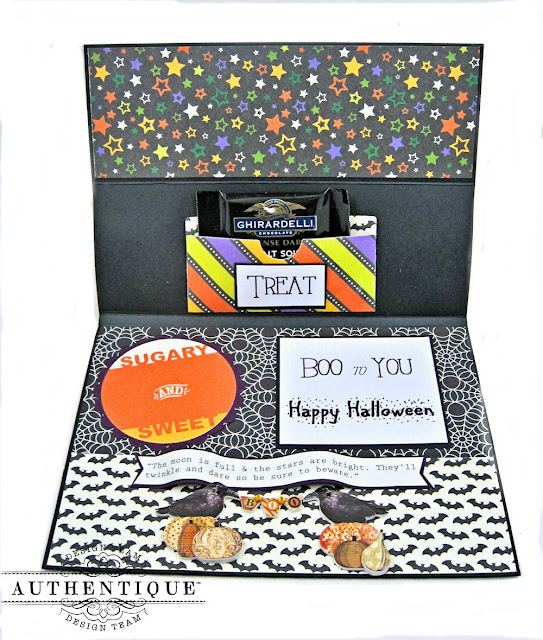 Inside, I've added a couple of pockets, sentiments, die cuts and some fun treats. 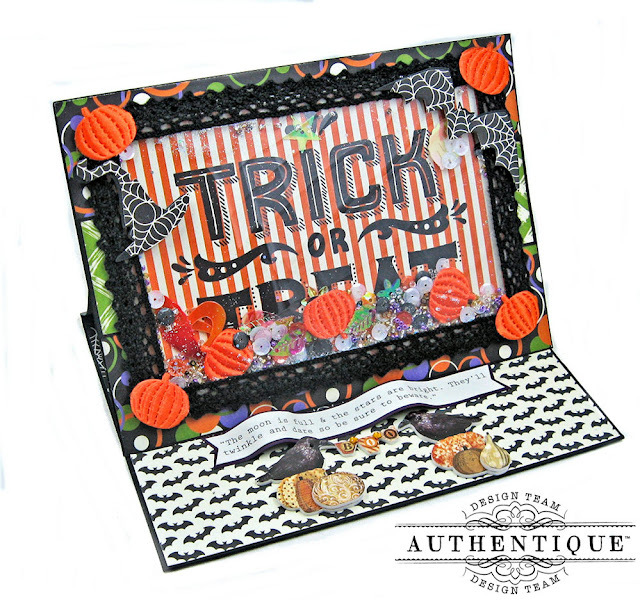 The 3.25" x 4.25' accordion style folio is the perfect place to preserve all your fun Halloween photos. It's held shut with a fancy paper clip embellie. 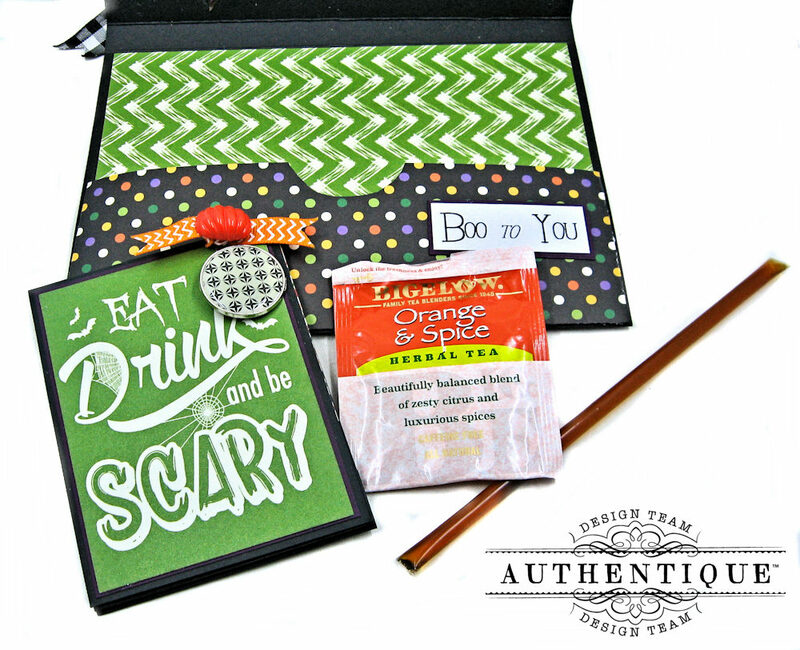 Chocolate, tea and a honey stick make this the perfect Halloween card for a friend or co-worker. To make the folio, I joined strips of 3.25" wide cardstock with 1/4" Scor-Tape. Then I scored every 4.25" and folded. I decorated this accordion style folio with leftover scraps of designer paper. This is such an easy way to use up scraps, clean your work surface and make something pretty all at the same time. 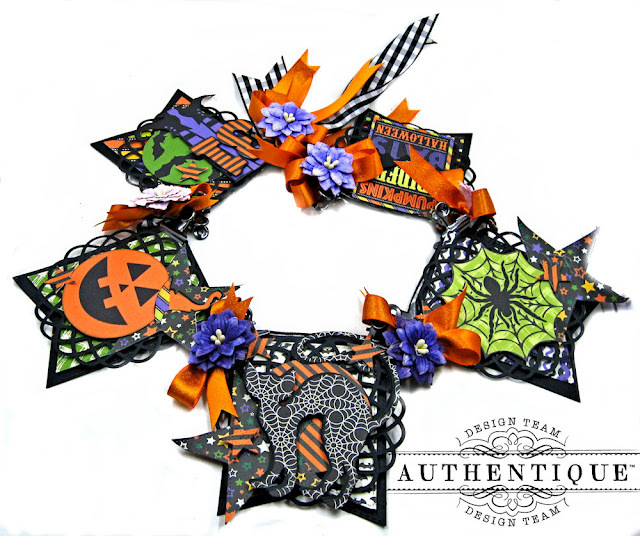 I hope I've shared some "Tricky" Halloween treats today that will inspire you to get out your scissors, glue and paper pretties and get your craft on!